That depends on what matters to you. Some people prefer certain luggage brands, while others are simply more brand conscious than others. Whereas some people do not care about brand names at all, they only want to find the best bag within their budget. Still, whatever your views on product branding are, the brand name can tell you a lot about the luggage you are considering and help you to find the best luggage for your travel needs. All product branding is about standing out from the crowd, i.e. to distinct the product from other products so the buyer is more likely to pick it. Branding not only helps the seller to be noticed, it can also help the seller to get certain message about the product across, e.g. about the product quality and service level. By going for certain brand name, buyers are likely to feel more confident about their purchase, i.e. know what they can expect (or at least they think so). So what information does the luggage brand name hold? What Does The Luggage Brand Tell You? The bag brand offers some valuable information, e.g. about the quality you can expect, the style, the target group, price range, etc. Luggage quality is important for all travelers. You want bag that protect your belongings. You don't want a bag that breaks down while travelling. Quality however comes at cost and the brand name can help you to identify the level of quality you can expect. 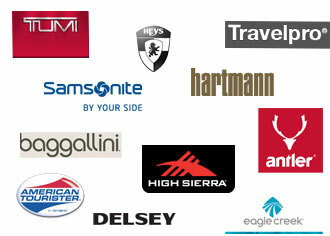 There are high quality brands, value for money brands and low-end quality brands. Most luggage manufacturers make all their products within the same quality category. For example, high quality brands tend to offer only high quality luggage. There may be different luggage versions, e.g. with fewer features, but the quality level remains high. So the bag brand can tell you what quality level you can expect but it can tell you much more. The brand name can also tell you what price you can expect to pay. The price usually follows the quality level, i.e. the better quality, the higher price. This is though not always the case. Some brands can price themselves above their quality level. While others can price them high because they are well known or heavily sought after. These can be popular or well-known brands, or those that are most fashionable or trendy. In those cases, you are paying for the brand name. Whereas some brands may be of high quality but still be struggling to get the prices that the better-known brands can achieve. So the price range does not necessarily reflect the quality level. Each brand name however tends to be within certain price range, i.e. expensive, moderate, or cheap. Some bag brands offer cheaper versions of their products but they still tend to be within the same price range, e.g. expensive and not as expensive (but still expensive). Most luggage manufacturers have distinct style, e.g. traditional, fashionable, functional, trendy, etc. You can of course find traditional bag that is trendy, fashionable and functional but then that is likely to be the overall style of that particular brand. Whatever style you are looking for, you are likely to find that some luggage brands offers lot of bags you like, while others have none you like. Different brands target different people. Some luggage manufacturers target all travelers, while others target business travelers, women travelers, adventure travelers or fashion conscious travelers. Meaning you can usually exclude some brands from your search from the beginning. The bottom line is that the luggage brand name gives you some idea of what you can expect from your bag. Like the Tumi brand targets discerning professionals and frequent travelers, offering luxury travel, business, and lifestyle accessories (high quality, high price, design excellence, technical innovation). Samsonite on the other hand is in the business of building confidence (as they say on their website). Their focus is therefore on reliability and durability, as well as style and innovative functionality. Making them appeal to the wider group of travelers. While Eagle Creek offers full spectrum of innovative travel solutions and can outfit any traveler for any adventure travelling. Innovation, durability and craftsmanship is an integral part of their brand name. All those luggage brands have very distinct image, you know what they stand for and therefore if they are likely to be what you are looking for or not. It is though not all about the brand. Even if you know and like some brand, you still need to evaluate and compare those features that matters most to you. Our Luggage Buying Advice will help you to do exactly that.